Calibration grating set TGS1F is intended for Z-axis calibration of scanning probe microscopes and nonlinearity measurements. Grating set contains 4 gratings TGZ1, TGZ2, TGZ3, TGZ4 with different step heights. 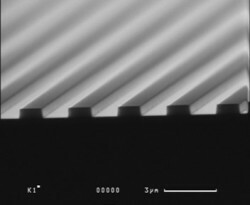 * - the average meaning based on the measurements of 5 gratings with the same height (from the batch of 300 gratings) by AFM calibrated by PTB certified grating set TGS1. Basic step height can vary from the specified one within ±10 % depending on the batch (for example TGZ1 grating can have step height 22±1.5 nm).